The clutch lever free play should measure 10.0-15.0 mm (0.39-0.59 in) as shown. Periodically check the clutch lever free play and, if necessary, adjust it as follows. Slide the rubber cover back at the clutch lever. To increase the clutch lever free play, turn the adjusting bolt in direction (a). 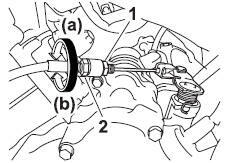 To decrease the clutch lever free play, turn the adjusting bolt in direction (b). If the specified clutch lever free play could be obtained as described above, skip steps 4-7. Fully turn the adjusting bolt at the clutch lever in direction (a) to loosen the clutch cable. Loosen the locknut at the crankcase. To increase the clutch lever free play, turn the adjusting nut in direction (a). To decrease the clutch lever free play, turn the adjusting nut in direction (b). Tighten the locknut at the crankcase. Tighten the locknut at the clutch lever and then slide the rubber cover to its original position.